Comment contacter les équipes pratiquant la technique de Ponseti à LYON ? Quelles-sont les équipes pratiquant la technique de Ponseti en France et dans le reste de l’Europe ? 1- AMIEL D, WOO SL, HARWOOD FL, AKESON WH. The effect of immobilization on collagen turnover in connective tissue: a biochemical-biomechanical correlation. Acta Orthop Scand .1982 : 53: 325-32.2- ARONSON J, PUSKARISH C L. Deformity and disability from treated clubfoot. J Pediatr Orthop 1990 : 10 : 109-119. 3- BANKS HH, GREEN WT. Correction of equines deformity in cerebral palsy. . J Bone Joint Surg 1958 : 40A : 1359-1379. 4- BENSAHEL H, CATTERALL A, DIMEGLIO A. Practical applications in idiopathic clubfoot : a retrospective multicentric study in EPOS. J Pediatr Orthop 1990 : 10 : 186-188. 5- BENSAHEL H, DEGRIPPES Y, BILLOT C. A propos de 600 cas de pied bot. Chir Ped 1980 : 21 : 335-342. 6- BENSAHEL H, GUILLAUME A. La rééducation dans le traitement du pied bot varus équin. Encycl Med Chir, Kinésithérapie, Fasc. 26428 : B10 : 1-8. 7- BENSAHEL H, GUILLAUME A, CSUKONYI Z, THEMAR-NOEL C. The intimacy of clubfoot : the ways of functional treatment. J Pediatr Orthop 1994 : 3B : 155-160. 8- BERARD J. Le traitement non opératoire du pied bot varus équin. In Moulies D, Tanguy A. Chirurgie et orthopédie du pied. Montpellier, Sauramps med 1988 : 203-209. 9- BINKLEY JM, PEAT M. The effects of immobilization on the ultrastructure and mechanical properties of the medial collateral ligament of rats. Clin Orthop .1986 : 301-8. 10- BROWNE D. Talipes equinovarus. Lancet :1934 :2: 969. 11- CAHUZAC JP, BAUNIN C, LUU S, ESTIVALEZES E, SALES DE GAUZY J, HOBATHO MC. Assessment of hind foot deformity by three-dimensional MRI in infant clubfoot. J Bone Joint Surg 1999 : 81B : 97-101. 12- CHASTAN B. Rééducation des pieds bots. Ed Frison-Roche. Paris, 1993. 13- CHEDEVILLE R, CARRIOU-VILALONGA J. Kinésithérapie orthopédique pédiatrique. Paris :1991 :Masson : 66-78. 14- CHESNEY D, BARKER S, MIEDZYBRODZKA Z, HAITES N, MAFFULLIN. Epidemiology and genetic theories in the etiology of congenital talipes equinovarus. Bull Hosp Jt Dis, 1999 : 58 (1) : 59-64. 15- CLAVERT JM. 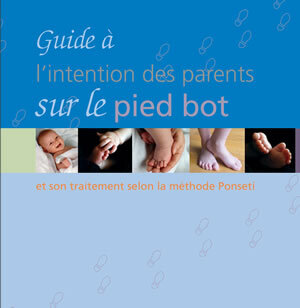 Le pied bot au présent. Pathogénie. Cahier d’enseignement de la SOFCOT n°43. Paris : Expansion scientifique française, 1993 : 33-40. 16- COOPER DM, DEITZ FR. Treatment of idiopathic clubfoot. J Bone Joint Surg 1995 : 77A : 1477-1489. 17- DELGADO MR, WILSON H, JOHNSTON C, RICHARDS S, KAROL L. A preliminary report of the use of botulinum toxin type A in infants wit clubfoot : four case studies. J Pediatr Orthop 2000 : 20 (4) : 533-8. 18- DENHAM RA. Congenital talipes equino-varus. J Bone Joint Surg 1967 : 49B : 583. 19- DEGA W. Orthopaedics and rehabilitation (Polish). Warsaw : PZWL 1964 : 237-47. 20- DIETZ FR. On the pathogenesis of clubfoot. Lancet 1985 : 8425 : 388-390. 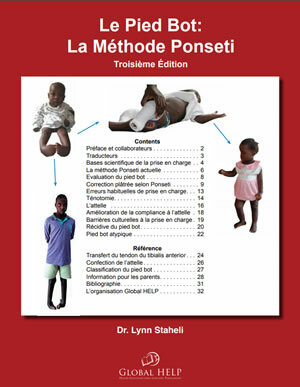 21- DIMEGLIO A, BENSAHEL H, SOUCHET PH, MAZEAU PH, BONNET F. Classification of clubfoot. J Pediatr Orthop 1995 : 4 B: 129-136. 22- DIMEGLIO A, BONNET F, MAZEAU P, DE ROSA V. Orthopaedic treatment and passive motion machine : consequences for the surgical treatment of clubfoot. J Pediatr Orthop 1996 : 5 : 173-80. 23- DIMEGLIO A, POUS JG. Le pied bot varus équin avant l’âge d’un an. Encycl Med Chir. Techniques chirurgicales, Orthopédie, 4, 2, 06, Fasc. 44921. 24- DOLIVEUX P. Le pied d’Hippolyte. Cahier d’enseignement de la SOFCOT n°43. Paris : Expansion scientifique française, 1993 : IX-XIII. 25- DOWNEY DJ, DRENNAN JC, GARCIA JF. Magnetic Resonance Image findings in congenital talipes equinovarus. J of Pediatr Orthop 1992 : 12 : 224-228. 26- DUMONTIER G, CHEDEVILLE R, SERINGE R, KOHLER R, POPILARSKI A L’attelle « Clubax » un nouveau concept pour le traitement fonctionnel du pied bot varus équin. Technique orthopédique internationale 1994 : 24 : 14-22. 27- FARABOEUF LH. Précis de manuel opératoire. Paris : 4th eds Masson 1893. 28- FIXSEN J, LLOYD-ROBERTS G. The foot in childhood. Edimbourg : Churchill Livingstone 1988 : 36-39. 29- FORSTER et Al. Results of percutaneous tendo achillis lengthening. 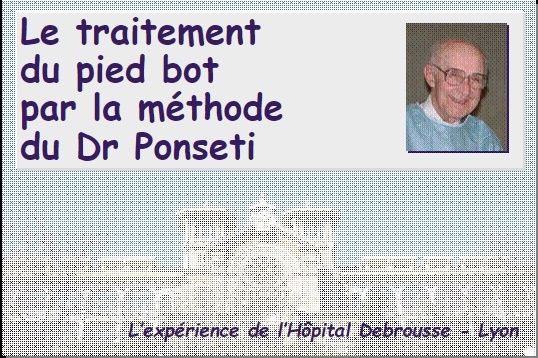 J of Pediatr Orthop 1996 : 16 : 549 (une seule page). 30- GAUBERT J, DELPRAT J, BARDIER M. Notre conduite thérapeutique du traitement orthopédique du pied bot varus équin métatarsus. Annales de Réadaptation et de Médecine Physique 1985 : 28 : 37-45. 31- GHALI N, SMITH R, CLAYDEN A, SILK F. The result of plantalar reduction in management of the congenital talipes equinovarus. J Bone Joint Surg 1983 : 65B : 1-7. 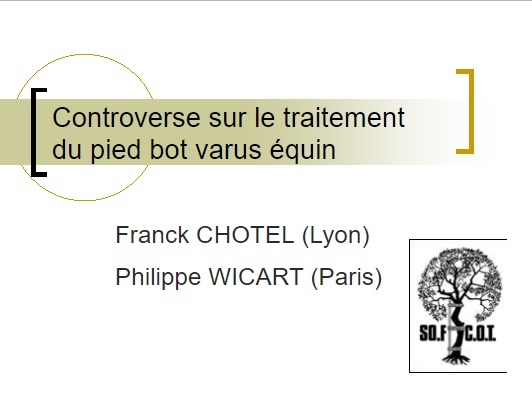 32- GHANEM I, SERINGE R. Comparaison des méthodes d’évaluation des résultats du traitement du pied bot varus équin congénital. Rev Chir Orthop 1995 : 81 : 616-621. 33- GRIFFET J. Quelle attitude adopter aujourd’hui devant le pied bot varus equin du nouveau-né ? Ann Kinésithérap 1986 : t13 n°5 : 239-241. 34- HARROLD AJ, WALKER CJ. Treatment and prognosis in congenital club foot. J Bone Joint Surg 1983 : 65 B : 8-11. 35- HERZENBERG JE, CARROLL NC, CHRISTOFERSEN MR, LEE EH, WHITE S, MUNROE R. Clubfoot analysis with three-dimensional computer modeling. J of Pediatr Orthop 1988 : 8 : 257-262. 36- HONEIN MA, PAULOZZI LJ, MOORE CA. Family history, maternal smoking, and clubfoot : an indication of a gene-environment interaction. Am J Epidemiol 2000 : 1;152 (7) : 658-65. 37- HUSON A, VAN LANGELAA N EJ, SPOOR CW. The talocrural mechanism and tibiotalar delay. Acta Morphol Neerl-Scand 1986 : 24 : 296 (une seule page). 38- HUTCHINS PM, FOSTER BK, PATERSON DC, COLE EA. Long term results of early surgical release in club feet. J Bone Joint Surg 1985 : 67B : 791-799. 39- IKEDA K. Conservative treatment of idiopathic clubfoot. J Pediatr Orthop 1992 : 12 : 217-223. 40- IMHÄUSER G. Die behandlung des idiopathischen klumpfusses. Stuttgart : EnkeVerlag 1984 : 9-18. 41- JONES R in TACHDJIAN. The child’s foot. Philadelphia, Saunders Cie.1985 : 176-186. 42- KARSKI T, WOSKO I. Experience in the conservative treatment of congenital clubfoot in newborns and infants. J Pediatr Orthop 1989 : 9 : 134-136. 43- KITE JH. The classic. Principles involved in the treatment of congenital clubfoot. Clin Orthop 1972 : 84 : 4-8. 44- LAAVEG J, PONSETI IV. Long term results of treatment of congenital clubfoot. J Bone Joint Surg 1980 : 62 A : 23-31. 45- LASCOMBES P. Pied bot varus équin idiopathique congénital. Description et conduite à tenir avant l’âge de 2 ans. Cahiers d’enseignement de la SOFCOT. Conférence d’enseignement 1990 : 39 : 67-84. 46- MAC KAY DW. New concept of and approach to clubfoot treatment : section II-Correction of the clubfoot. J Pediatr Orthop 1983 : 3 : 10-21. 47- MALONE FD, MARINO T, BIANCHI DW, JOHNSTON K, D’ALTON ME. Isolated clubfoot diagnosed prenatally : is karyotyping indicated ? Obstet Gynecol 2000 : 95 (3) : 437-440. 49- MASSE P. Le traitement du pied bot par la méthode fonctionnelle. In : Cahiers d’enseignement de la SOFCOT. Paris : Expansion scientifique française 1977 : 3 : 51-56. 50- METAIZEAU JP, LEMELLE JL. Continuous passive motion in the treatment of the congenital clubfoot. Med Orth Tech 1991 : 111 : 194-198. 51- NAPIONTEK M. Clinical and radiographic appearance of congenital talipes equinovarus after successful nonoperative treatment. J Pediatr Orthop 1996 : 16 : 67-72. 52- NATHER A, BOSE K. Conservative and surgical treatment of club foot. J Pediatr Orthop 1981 : 7 : 42-48. 53- PETRI CH. Über den angeborenen klumpfuss. Ther Umschau 1971 : 5 : 309-14. 54- PONSETI IV. Congenital clubfoot fundamentals of treatment. New York, Oxford University Press 1996. 55- PONSETI IV. Common errors in the treatment of congenital clubfoot. International Orthopaedics (SICOT) 1997 : 21 : 137-141. 56- PONSETI IV Treatment of congenital club foot. J Bone Joint Surg 1992 : 74A : 448-54. 57- POUS JG, DIMEGLIO A. Neonatal surgery in clubfoot. Orthop Clin North Am 1978 : 9 : 233-240. 58- POUS JG, MILON E. Variations stratégiques et techniques au traitement initial. Cahier d’enseignement de la SOFCOT n°43. Paris : Expansion scientifique française, 1993 : 65-72. 59- RADKE J, JANSSEN R. Zur klinik und therapie des angeborenen klumpfusses. Med Monatsschr 1974 : 7 : 293-6. 60- RICHARDS BS, WILSON H, JOHNSTON CE. Non-operative club-foot treatment comparing the French technique to serial casting-early results. Presented at POSNA .Lake Buena Vista, FL, May 15-19, 1999. 61- RIÖPPY S, SAIRAREN H. Neonatal operative treatment of clubfoot. J Bone Joint Surg 1983 : 65B : 320-325. 62- SERINGE R.Anatomie pathologique et physiopathologie du pied bot varus équin congénital. Cahiers d’enseignement de la SOFCOT. Paris : Expansion scientifique française 1977 : 3 : 11-24. 63- SERINGE R, ATIA R. Pied bot varus équin congénital idiopathique : résultats du traitement « fonctionnel » (269 pieds). Rev Chir Orthop 1990 : 76 : 490-501. 64- SERINGE R, CHEDEVILLE R. Le pied bot au présent. Traitement non chirurgical. Cahier d’enseignement de la SOFCOT n°43. Paris : Expansion scientifique française, 1993 : 41-53. 65- SERINGE R, HERLIN P, KOHLER R et Coll. A new articulated splint for clubfoot. In : Simons G. Clubfoot. New York, Springer Verlag 1992. 66- SIMONS GW, TACHDJIAN MO. Treatment of club feet from birth to two years of age. Cahiers d’enseignement de la SOFCOT. Paris : Expansion scientifique française 1977 : 3 : 31-50. 67- TAUSSIG G. La méthode dite fonctionnelle du traitement du pied bot varus equin congénital. J Réadap Med 1983 : 3 n°5 : 167-172. 68- TURCO VJ. Present management of idiopathic clubfoot. J Pediatr Orthop 1994 : 3 : 149-154. 69- WEDGE J, ALMS M. A method of treating clubfeet with malleable splints. J Pediatr Orthop 1983 : 3 : 108-112. 70- WHITE WF. Flexor muscle slide in the spastic hand. J Bone Joint Surg 1972 : 54B : 453-459. 71- WISBRUN W. Neue Gesichtspunkte zum redressement des angeborenen klumpfßes und daraus sich ergebende schlußfolgerungen bezüglich der Äetiologie. Arch Orthop 1932 : 31: 451-64. 72- YAMAMOTO H, FURUYA K. Treatment of congenital clubfoot with a modified Denis Browne splint. J Bone Joint Surg 1990 : 72 B : 460-463. 73- YAMAMOTO H, MUNETA T, MORITA S. Non surgical treatment of congenital clubfoot with manipulation, cast, and modified Denis Browne splint. J Pediatr Orthop 1998 : 18 : 538-542.